* Only 20 messages (with links and videos) to read, and watch. When Amir and Ethan have the time, maybe they'd like to add their own comments? At some point I will write Part 3 that will talk about what to do with the measurements. For now, I highly recommend NOT reading AVS Forum threads. The few who corner the threads follow 1970s school of acoustics. Ask them to show you one blind test or recent research paper that backs what they say. You won't find any. Modern acoustics relies on psychoacoustics research. Without that, you are shooting in the dark as the people in 1970s did. Ok, I won't read AVSForum threads no more. Is it ok then to refer them to your Room Measurement Tutorial for Dummies - Part 1, 2 and 3 threads? Amir, what about reading Audioholics forum threads and articles, ...Gene and gang? Floyd is an active member there. I am not on Audioholics so don't know what they discuss. I did read the AVS page you linked to and what Gene said is correct there. In other areas I have found issues with Gene's articles such as measuring HDMI performance. Recent versions of REW make a "With JRE" installation option available. These install a private JRE that's only usable by REW. I went this route and uninstalled my global Java, which gets rid of the security concerns with the global Java being used by default by web browsers, as well as the annoyance of Java upgrade notifications. It's a great solution if REW is the only Java program you use. These installers can be found on the main REW download page. There is also an installers download page that allows you to download earlier versions in case you're experiencing a bug in a newer one. It's also the place to grab the latest beta. Earlier versions use the word "offline" in the file name to denote an installer with a private JRE, while the 5.15 release version uses the more descriptive "with_JRE" in the file name of the installer. 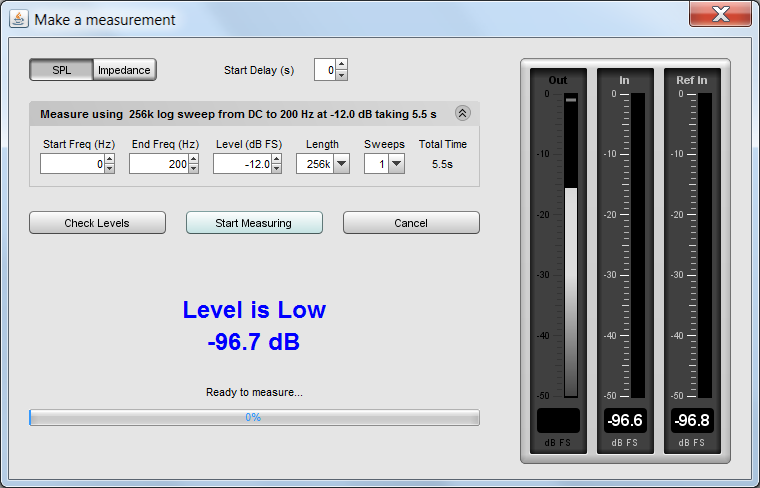 The latest version of REW, version 5.15 as of now, has the new "acoustic timing reference" feature, which allows time-synchronized measurements to be performed with a USB mic. Such measurements are useful for e.g. design of DIY speakers, for which you want to do time alignment of the midrange and tweeter. It also makes USB mics usable in Multi-Sub Optimizer. Measurements made with the acoustic timing reference do not have the correct absolute delay in their impulse response, but if multiple measurements are performed with the same timing reference, their relative delays will be correct. This is all that's needed for most applications. More information about the acoustic timing reference can be found in this post by John Mulcahy. The limitation he mentions of not being able to do a conventional measurement of the timing reference channel was an issue with early betas only and was fixed in later betas and the production version. That's excellent news Andy! I keep deleting the Java runtime, only to run REW and have it fail. Will have to download the private runtime for it. Thanks. And on USB mic, you mean John found a way to compensate for the delay in them? If an acoustic timing reference is used REW will generate a timing signal on the output that has been selected to act as the reference before it generates measurement sweeps on the channels being measured. The timing signal is a high frequency sweep to allow accurate timing, a subwoofer cannot be used as the reference channel. Measurements will have a time delay that corresponds to the difference in their distance from the microphone compared to the distance of the reference speaker - if the reference speaker is further away the delay would be negative. Note that multiple sweeps cannot be used when using an acoustic timing reference. If a timing reference is not being used REW will set the IR zero time according to the setting of Set t=0 at IR peak. Looks like a decent workaround. I use multiple sweeps to get better signal to noise ratio and don't use timing for anything so it won't matter to me. But for people who use it to find reflection points, it should be quite useful. For stereo, pick one speaker as the reference. I picked 'left'. 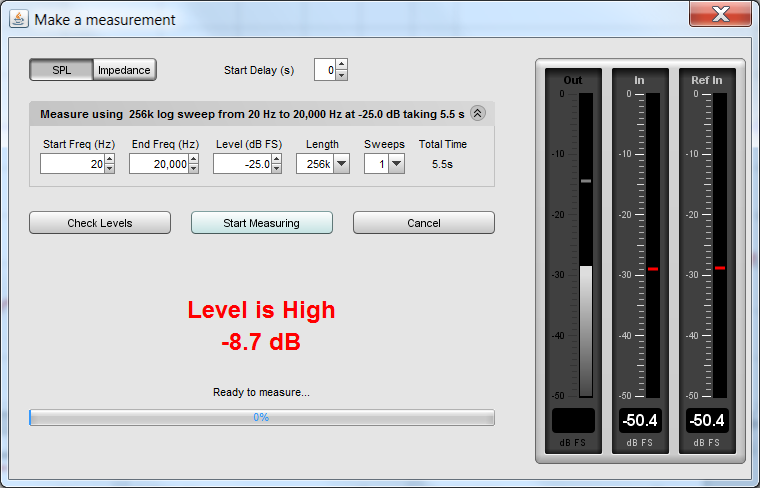 Using DSP, I can add delay in 0.02 ms/6.88 mm increments. I did that for the right speaker, and the impulse response for the delayed speaker shows the proper delay. 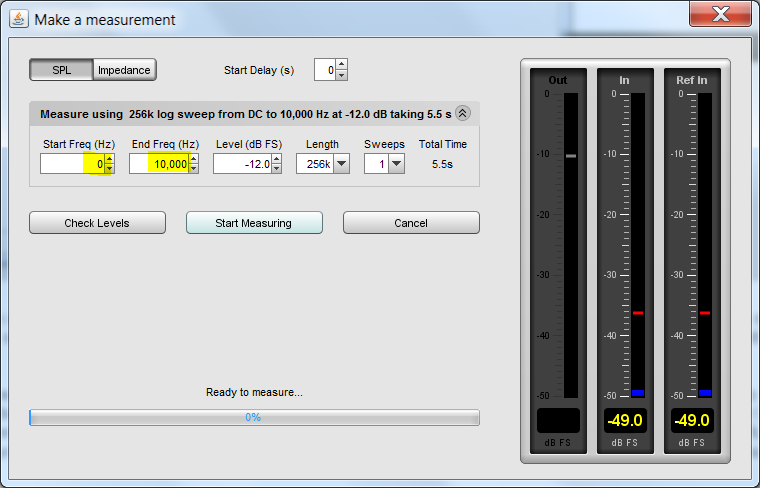 So, the new REW Acoustinc Timing reference works in that respect, at least. Good to know. Thanks Ray. Amir, Thanks so much for this detailed tutorial, I've just started down the road of learning REW and later will look at the hardware. Since I am a complete "Dummy" here I though I would make a small comment on the outlined initial steps. I spent the better part of the day yesterday trying to figure out why I apparently didn't have a microphone connection on any of my 3 Linux and 1 Windoz XP installs? It wasn't until I was fumbling around that I skipped ahead to Step 3 and clicked on "Check Levels" and all of a sudden the three VU meters became active and I found out my mic's were functioning after all. Maybe the V5.16 version I have installed is different than the V5 you wrote against? In any case in V5.16 the VU meters are not active after you just click on the main pages Measure button and require either the Check Levels or Start Measuring buttons function. Will be taking the next first measuring steps over the upcoming weeks. Thanks again for all the work you've put into this, and all the rest of the excellent articles on the Home page. There's nothing like it for Audiophiles anywhere on the web that I'm aware of. any one knows where I can find part 3? Yeah strange that part 1 and 2 was in quick sequence....appreciate in advance for part 3 soon..
Amir had written these and many other of the informative threads on the home page at earlier dates. He just collected and imported them here from outside locations recently when he created this site back in Feb of this year. I used R.E.W before with a focusrite interface and had no problems, but now i have the tascam US-1800 and the REW wont recognize my inputs-outputs, i've tried it all, maybe i'm doing something wrong. 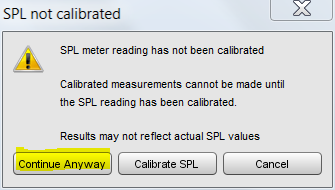 That is completely true, for that you need to calibrate the SPL meter in REW with a real SPL meter and that takes a lot of time assuming you have the money to buy the SPL meter in the first place. REW is a great tool and the best of all is that is free.. so it's worth the effort of learning how to use it. Thanks for the information. Beatsbooster is designed to help you with the decision-making when buying your first best headphones under $50. I highlight the products which are the best value, as well as the top sellers. There is an REW thread on AVS that is useful and if you ping the authors from the contact info in the program they are pretty responsive. If you buy the UMIK-1 mic, download the calibration for it, then point REW to where you have it stored, it was my understanding that REW will then be all set for SPL. I could have mis-understood things but I believe the way the UMIK-1 is recognized by REW, etc: was part of REW's newer package updates some time back, maybe even post the time Amir wrote the tutorial?